The Asscher cut diamond goes way back to 1902 Holland when the Asscher brothers first produced this diamond shape specifically for engagement rings. These brothers had become famous for cutting the largest rough stone in the world, the 3,106-carat Cullinan. Asscher cut diamonds went on to become quite popular in the 1920s. But, until recently the Asscher cut could only be found in antique jewelry stores. One century after the Asscher brothers first cut their namesake diamond, in 2002; the shape started making a comeback. This was spurred on by modifications to the cut giving it more brilliance than the original Asscher cut diamonds. Ever since the asscher cut engagement ring has been a widely popular choice, especially when paired with art deco or other vintage ring settings. Today’s Asscher cut is shaped much like a square emerald cut diamond. The difference is in the smaller table, higher crown, and larger step cuts. These subtle differences often result in a more brilliant diamond than you have with emerald cuts. Peering down into the table of a well-cut Asscher diamond, you should see concentric squares. But, this would only occur if the pavilion facets beneath were positioned properly. The Asscher cut, just like the emerald cut, is cropped at the corners. But, since an Asscher diamond is square shaped, cropping the corners makes it look octagonal. However, once the diamond is set with four prongs, the Asscher cut keeps it unique square shape. The Asscher cut diamond has traditionally been a square shape with a 1.00 length to width ratio. However, they can also be found cut in a slight rectangular shape. If the length to width ratio is 1.05 or less, the naked eye will see it as square. Every diamond we display will have its exact measurements shown, along with its length to width ratio. Therefore, you will know exactly what size and shape Asscher you are looking at. 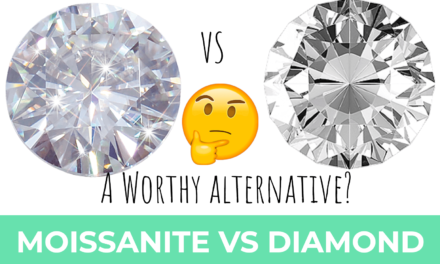 Choosing the color you want in an Asscher cut diamond is a purely subjective exercise. We have found that many buyers prefer a slightly warmer colored diamond, which would be a G-H. The more expensive cool colorless diamonds have a color grade of D-F. As with anything, price is a matter of supply and demand. Some buyers are only interested in the D-F color grades and accept that they will cost more. Honestly speaking, the actual color differences are so small that they are very hard to perceive. If there were no such thing as diamond color grading, prices of the higher grades wouldn’t be so much. 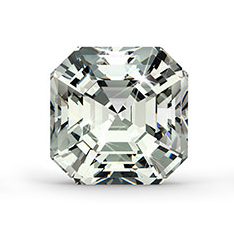 The color of an Asscher cut diamond is easier to see with its large open facets. This is especially true with diamonds that are 1.5 carats or larger. The Asscher cut diamond has a flat table, which gives you an unobstructed look right into its center. Any inclusions could easily be seen with the naked eye, which makes it more difficult to find eye clean asscher cut diamonds. 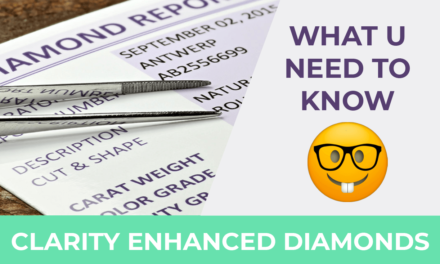 Therefore, we recommend that you only consider stones with at least a VS2 clarity grade. With other diamond cuts you could get away with a lower clarity grade, but not with an Asscher cut. In this case, you really need an eye clean diamond. When inspecting an Asscher cut diamond, if it has any inclusions they can often be seen with the naked eye. The goal for many people out shopping for a diamond is to balance the price with the appearance. In many diamond shapes an SI1 clarity grade may offer a great balance between price and appearance. But, in an Asscher cut you may need a clarity grade of VS2 if you’re looking a comparable choice. The Asscher cut is very versatile and looks beautiful in any number of ring settings. People frequently describe this shape as having an architectural Art Deco look, which was so prevalent in the 1920s. In fact, it was during the Roaring Twenties when these diamonds were at their peak of popularity. Asscher cut diamonds look sublime in vintage-style ring settings with clean lines and elaborate detailing. This cut is not known for its brilliance when compared to other diamond shapes. 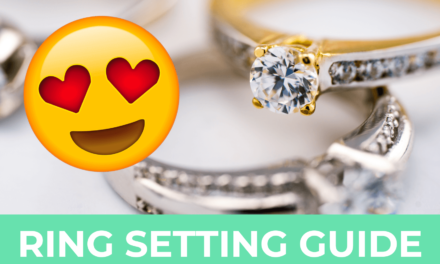 When set in a halo ring setting as the center stone, an Asscher cut seems to sparkle more. For even more sparkle, wear it with an eternity-style wedding band with small diamonds all around. Asscher cut diamonds also work beautifully in tennis bracelets and earrings. No matter how you decide to set your Asscher cut diamond(s), just wearing this cut sets you apart from others. This is a highly sophisticated cut that signifies class, refinement and elegance. This is the perfect diamond shape for women who love emerald cuts, but prefer a square shape. It’s not easy to find a perfect diamond, but if you want an eye clean diamond, advanced technology helps. It is now possible to examine Asscher cut diamonds in high-quality magnified photographs as well as 360° HD videos. In my opinion, you can get a far better look this way than you can at a jewelry store. A standard diamond loupe only gives you 10X magnification. 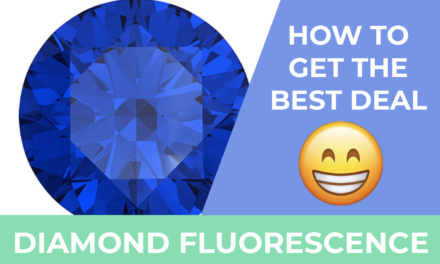 At a reputable diamond store online you will get up to 40X magnification! There are a few online jewelers that display diamonds digitally using high-tech imagery. But, we wholeheartedly recommend James Allen since they utilize the most advanced diamond display technology. Bottomline: Asscher cut diamonds exude style and class. This diamond cut takes one back to the romance and excitement of the 1920s. Feminine women who are a bit old-fashioned, who love antiques and anything vintage will love wearing an Asscher cut. Beyond the famous shape created a century ago by Joseph Asscher, these diamonds are the epitome of classic elegance. PreviousVVS2 Diamonds are Considered Nearly Perfect – But Are They Worth It? NextHow Much Does a 1 Carat Diamond Cost?